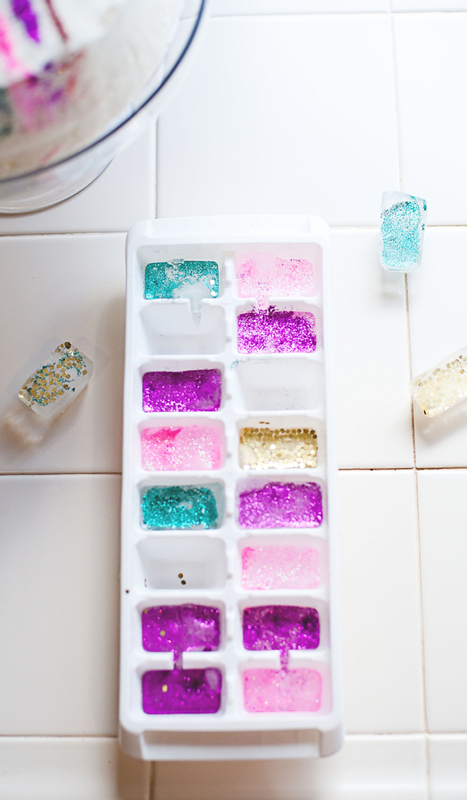 After yesterday’s glitter crafting party, I have one more sparkly thing to share – glitter ice cubes! They might be my favorite new party element for always and forever! We served sparkling champagne and sparkling water during the glitter party in glasses filled these glitter ice cubes. The frozen cubes of awesome gave our drinks a festive and sparkly vibe. They’ll be amazing to use for birthday parties and any one of the quickly upcoming holidays. I figured this method out after a failed try in adding the glitter to the unfrozen water. It just ends up dissolving and coloring the water (not adding sparkle). 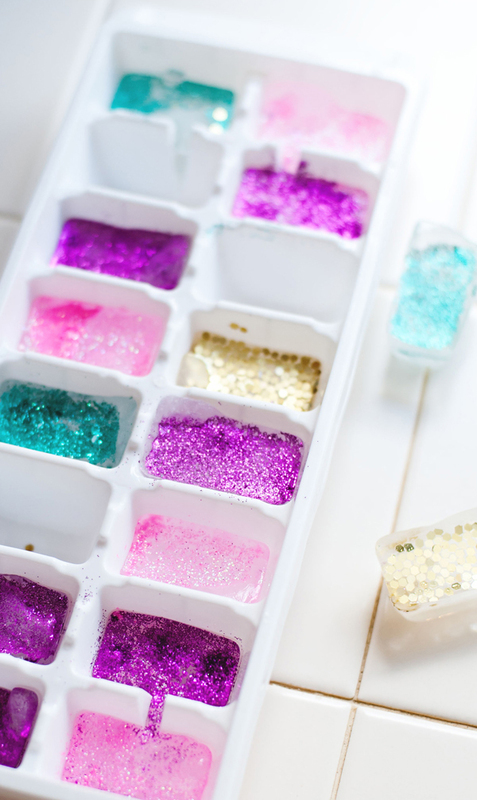 However, if the cubes are frozen before, the glitter will stick right to the bottom and you’ll be left with a gorgeously hued surprise for serving drinks at your next shindig. 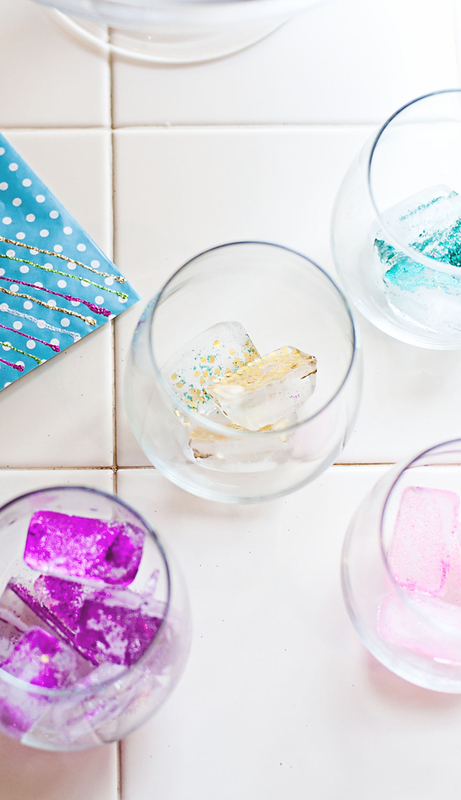 Once the drinks are poured the ice cubes will melt and the glitter will become a part of your cocktail, adding a little taste of sweet sugar and a massive dose of colorful, sparkly fun! Happy glitter filled drinking. PS. Try on a pair of these sparkly heels for more glitter fun! Oh, what an amazing idea. It really looks easy to make and the drinks looks funny. 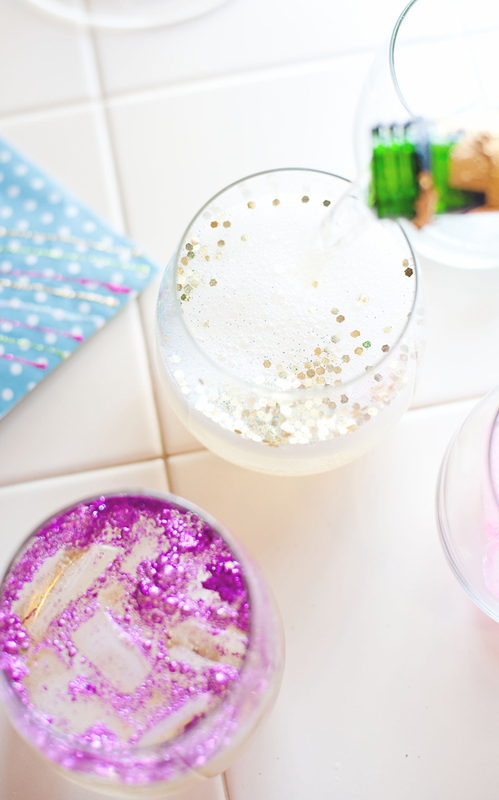 It will make good impression to every guest invited to a party where drinks are served with a glitter ice cubes. It is just perfect for kids parties but I really believe that the grown ups will also be very happy with an interesting colourful drink in their hands. This is plastic craft glitter. It should never be eaten, by anyone, but certainly should not be served to children. They are edible, you can buy some in the baking section of craft stores or online for more variety. They eventually dissolve in liquids. These are posted in many places. The picture shows inedible plastic glitter–all of the particles of each color are the same shape & size, unlike edible glitter flakes. The method described will work with edible glitter made from sanding sugar, gum arabic, or gelatin, but the minute they hit liquid, the effect is gone. Beer breweries are adding an edible glitter to kegs now and it doesn’t seem to dissolve. It does have gum arabic in it, but the videos I’ve seen showing the product doesn’t say where to get it. You only use edible glitter. Look near cake making section at superstore. Well duh. Like others have said she says edible glitter. The word edible means you can eat it. If she’s using plastic glitter maybe it’s because she can’t find edible glow glitter. You can’t buy this at a supermarket. Maybe you can buy at a craft/hobby store or store that sells molds to make your own chocolate/candy etc. I’m obsessed!!! I LOVE it! Do you have any favorite edible glitter brands you prefer? The only “edible glitter” carried by Joann’s are cake sparkles and the shaped [gum based] hearts and stars–about 6 items total and all in the cake deco aisle. ALL of those will melt in water or liquid. Any other glitter at Joann’s is NOT edible, but disco dust is not edible, either, because it is plastic craft glitter. The disco dust from NY Cake is also plastic glitter and is not to be eaten. Uh, this is awesome!! 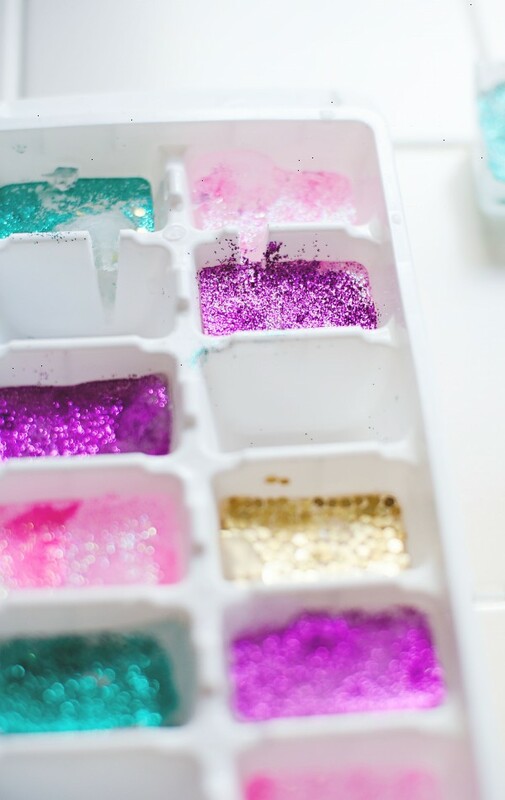 I have never seen such beautiful edible glitter… I agree with Bianca, brands please!? This glitter is NOT EDIBLE!!! It’s plastic craft glitter–that is what “Disco Dust” is–PLASTIC. Disco dust is not to be eaten. It’s a scrapbooking supply that’s been misappropriated. Doesn’t matter that it’s non toxic–it’s still plastic. Edible glitter is made from gum arabic, sanding sugar, or gelatin [all water soluble]. Still not something to put on the health food list, but for a birthday… totally worth it! I can pretty much die happy now, these are AMAZING! Such a fun party idea! This would be a great hit during the holiday season! Pingback: When You Need To Cool These Cool Items In A Really Cool Way, You Try This Cool Trick. It’s Just Ingenious! I just want to warn everyone, non-toxic does not mean the glitter is edible. It means you can use it for decorations that might come in touch with food, but are not supposed to be eaten. the packaging should specifically say ‘edible’. Whoa. These are *literally* the coolest idea ever. Thank you for the inspiration! So the glitter doesn’t melt or gum up? That’s great!